Apogee Instruments' Infrared Radiometer was selected to be part of autonomous vineyard monitoring robot. The ultimate goal is to help wine producers measure the key parameters of the vineyard including water availability, temperature of the leaf / crown of the vine, and the vigor of the plant. The robot is using Apogee's SI-411 for measuring canopy temperature. 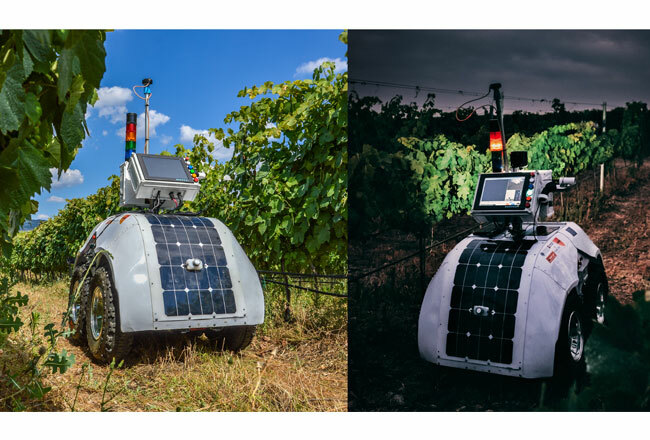 Autonomous vineyard monitoring robot featuring Apogee Instruments' infrared radiometer. Professor Francisco Rovira, director of the Laboratory of Agricultural Robotics (ARL) of the UPV and coordinator of the project said, "Our robot allows an intensive sampling, going from twenty measurements per hour using the traditional method to more than three thousand data per hour without the user having to make an effort to get the measurements. In the end, the producer obtains a map of his plot with data that gives him an idea of when to activate the irrigation if he has it on the plot, or of the date of the harvest, as well as the distribution of the most productive plants of his vineyard." Autonomous vineyard monitoring robots use Apogee Instruments' infrared radiometer to generate maps of temperature and vigor of the plants in real time.